Hi Everyone! 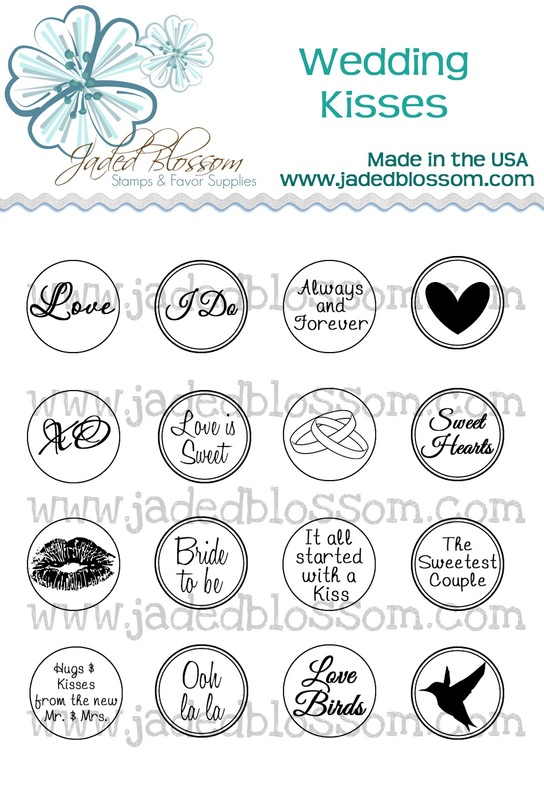 Happy Thursday and welcome to the Jaded Blossom Stamp Release Blog Hop! We are sooo excited to share these stamps with you. Sooo many ways to use them. 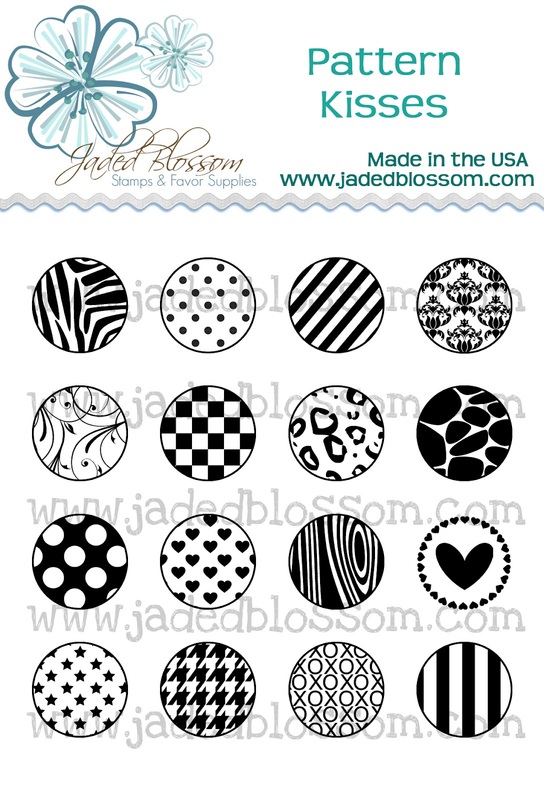 If you haven't been checking out our sneaks all week- we have created 6 stamp sets that can be punched out using a 3/4th inch circle punch. 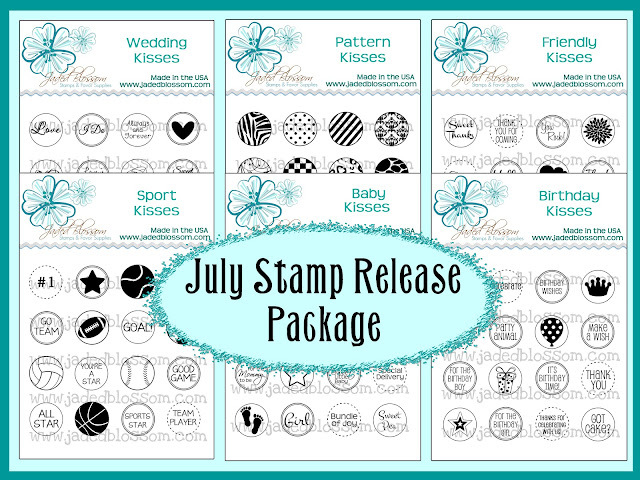 These stamps can then be put on the bottom of hershey kisses, rolos, mini peanut butter cups etc! And they don't have to be used just on candy, they can be used on cards and other favor type items as well. Here is the recap again..
And of course we had to carry some new bags in the store! 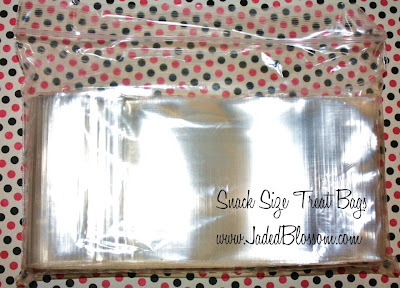 These bags are 3x4 inches and PERFECT to hold some of those hershey kisses! We are selling these bags in sets of 100 for $3.99! Yup, only $3.99! 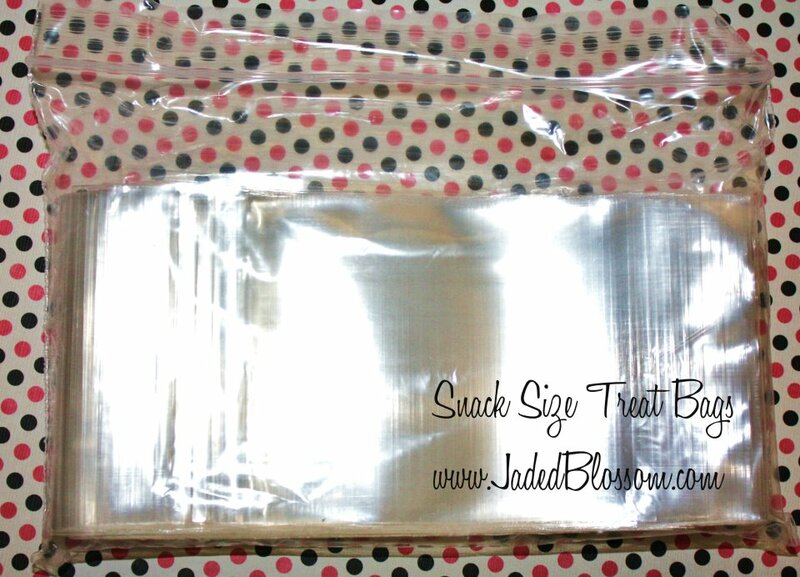 And to make it EVEN BETTER - The first 30 customers will receive 20 of the 3x4 treat bags FOR FREE!! AND Whats a blog hop without PRIZES? Well yes we are giving away some Twine, new Echo Park 6x6 Paper Stack and 50 of the new 3x4 treat bags. Just simple comment on this blog and all of the design team blogs to qualify to win. We will announce the winner on monday along with last months winner for the big customer prize! Now on to your next stop in the blog hop, MICHELLE!! 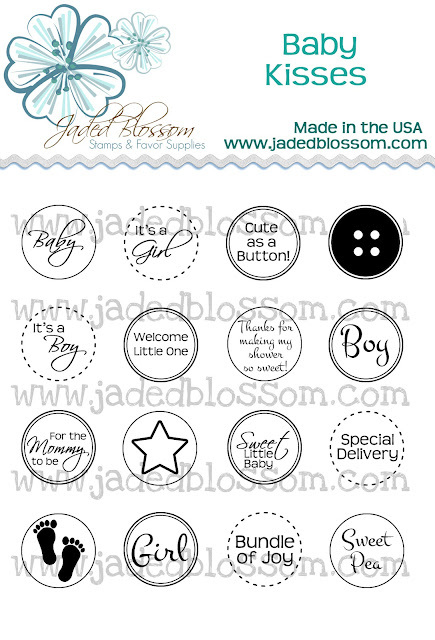 Can't wait to get these --- so many ideas for these! THANKS FOR SHARING I JUST PUT MY OREDER IN FOR ALL OF THEM :) SUPER EXCITED!! CAN'T WAIT TO GET THEM. I absolutely love this released!!! They are amazing, amazing, amazing!!!! 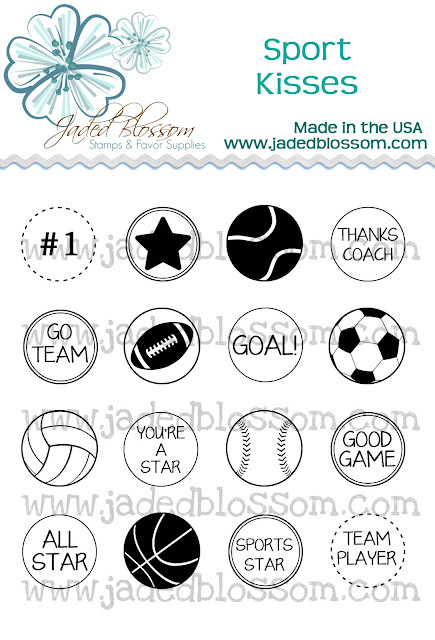 Awesome job Jaded Blossom!!!!! Absolutely LOVE this new set.....so many things to make with these! 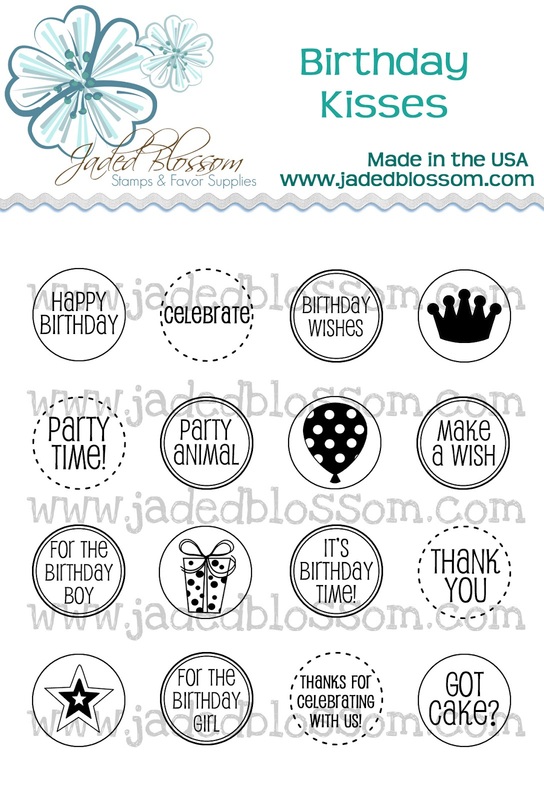 Very cool love the Patterened kisses, and the birthday ones. Too cute. WooHoo ordered this whole release! So useful! Woo Hoo just placed my order! Just placed my order. Really excited for the Birthday kisses! First time & so happy I found you. Love the baby kisses.love the creations DT have created with new release. Can't wait to get my pattern kisses set and share my project with you!!! These are so fun! The DT gals have shown some fabulous ideas too! LOVE, LOVE, LOVE!!! I can see using these for so many things! 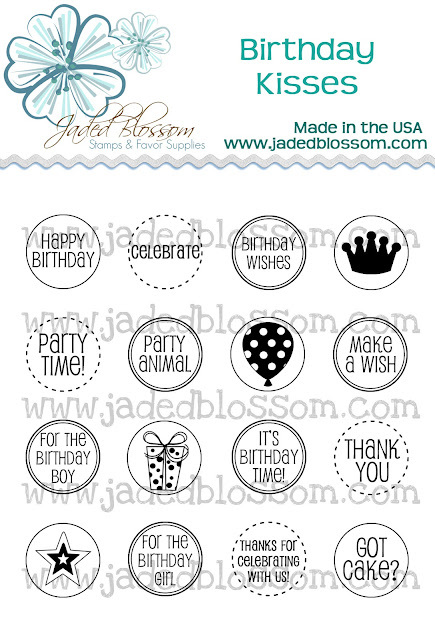 I make a lot of party favors or gift bags for friends and parties and these will be perfect! Awesome work from the DT!! The showed off the stamps in some wonderful creations! Just finished the hop and all I can say is WOW WOW WOW!!! Everyone did an excellent job! Now to convince my hubby y I need the whole set!!! Lol!!! Love love love this release. You ladies are fabulous! very cute ideas! lots of variety to pick from! Oh my gosh these are adorable!!!!!! 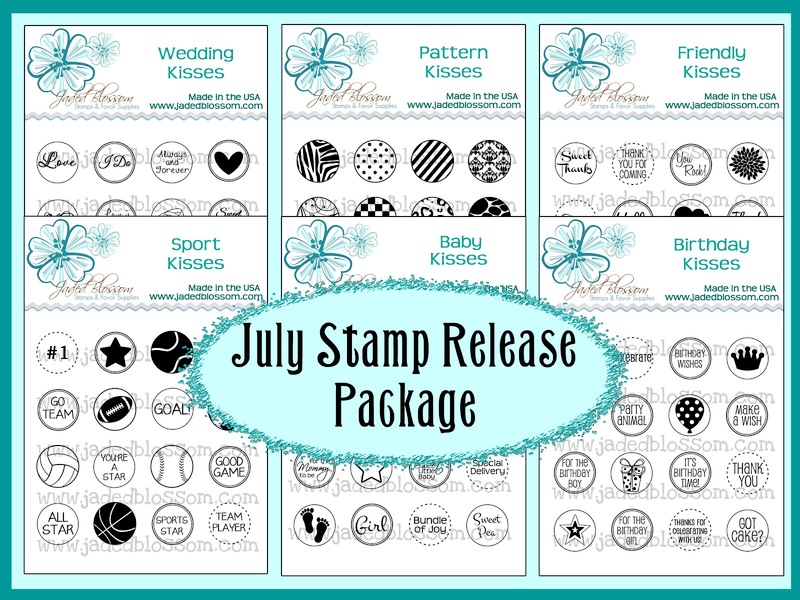 What great stamp sets!!! so versatille! I can see using these in sooo many ways!!!! Love them! OMG!!! I want them alllllll!! They are so cute!! Such a great idea!! Can't wait to get paid so I can order some! I'm a follower for life now! Great release ladies! Love them and the idea! Great price as well!!Thanks! I love this release! Thank you for giving me the opportunity to be the guest designer for July, had a lot of fun! These are so much fun! I love the birthday set! This is such a cute release!! I love it!! !